This week we are looking at: Route No. 38: “Through Liguria to Tuscany” which begins in Nice, passing through Monaco into Italy ending in Pisa. There is some wonderful scenery on this short journey, though to see the best of it, you’ll really need to get off the train and linger. Genoa is an obvious choice for an overnight stop, but you may want to be more creative and choose one or two smaller communities to stay for a day or two. Smaller towns which are among our personal favourites are Menton, Sanremo, Albenga, Santa Margherita Ligure and Vernazza, though the last of these is so formidably busy in summer that we would not even think of stopping there other than in the depths of winter. Slowish regional trains run at least every couple of hours along every section of this route, so it’s perfectly possible to travel spontaneously and just buy tickets along the way. If you are in a rush, you can travel from Nice to Pisa in about six hours, with just a single change of train in Genoa. 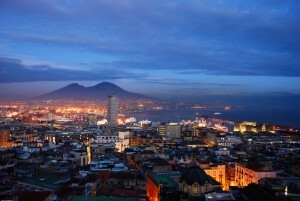 PHOTO: ‘Bay of Naples’ posted on www.freeimages.com by user krzysiuc. This week we are looking at: Route No. 42: “South to Sicily” which runs from Rome through Naples and Sicily ending in Siracusa. This is a journey which ventures past the point where most rail travellers visiting Italy turn round and head back home. It gives a taste of the fiery harsh lands of Basilicata and it takes in a great sweep of the Calabrian coast. In a word, this is the finest coastal rail journey in this book – though that’s not to diminish the appeal of Routes 3 and 38, which between them lead from Provence through Liguria to Tuscany, sticking to the Mediterranean coast for much of the way. Route 42 includes a short hop on a ferry from Villa San Giovanni, at the toe of the Italian mainland, to the Sicilian port of Messina. Five trains each day are shunted onto ferries for the crossing over the Strait of Messina. The end game is Sicily, the largest island in the Mediterranean (just beating Sardinia to that record). Successive invasions by Greeks, Romans, Arabs, Normans, French and Spanish have shaped the Sicilian character; the land is a strange mixture of fertile plains, volcanic lava fields and rocky desert, while Mount Etna, the great volcano, is omnipresent, smoking in the background.